Chivalry-noun, defined as "the sum of the ideal qualifications of a knight, including courtesy, generosity, valor, and dexterity in arms." A couple of co-workers of mine were discussing chivalry with me a day or two ago. Both of them agreed that if a man and a woman came to Starbucks together, and both offered to pay, that it was inappropriate to take payment from the lady. They believed that a gentleman should always pay for his lady, hold doors open, the whole nine yards. I felt the need to agree and disagree with them. 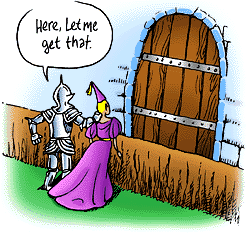 For one, I think the ideas of chivalry are rather convoluted in these modern times. In terms of courtesy, I think manners are important no matter who you are and no matter your relation to the people around you. If a stranger holds a door for you, you should always say thank you, but you should do the same if it is a good friend or significant other, male or female. I have held doors open for men as well, and as long as they thank me, I don't find fault in them taking me up on the offer. However, some think, in this case, a gentleman should reach around to allow the lady to walk in first. For me, as long as there is a "thank you," I don't see anything wrong with the man walking through first. I think this all falls in general manners. The part that my co-workers were insistent about involved couples. I think this stems from older ideals about wooing and caring for women. Men had to prove that they could care for and support a woman, so men would pay (of course, during these time periods, I think it is safe to assume that most men worked and few women did) and act in a way that was meant to "win over" their lady. Being as independent as I am, and as iffy about money (I am so bad with money, it is difficult for me to have anyone involved with me, financially), I did not care for such treatment. I felt that even in the act of holding doors, attention was being drawn to me when I wanted none. As for payment, I never wanted to feel obligated to a man for anything, so I have always paid half or my date and I would take turns. I will amend that in long-term relationships, the ideas of chivalry seem more acceptable to me. I don't even think about it now, when Isaac opens doors for me or walks on the street side of the sidewalk. He even pays for more than I do anymore. However, after nearly six years together, I think the nature of our relationship allows for such things. For the first several years, we alternated paying (and I still like to pay for things when I can). While he has always been good about "taking care of me," he has always done so in a way that was not intrusive, attention drawing, or unnatural. His genuine and natural attempts to act in a chivalrous manner made it easy to accept as a gift with no string attached. I have not always felt so about other men I have encountered. However, I like to do nice things for him, too, to show him that I love him, even if its something as simple as buying him dinner. It seems unfair to expect him to do everything for me and for me to do nothing for him. "Molly took up her own knife and began to slice the peppers. 'Then perhaps the Lady Amalthea is not to be won by great deeds.'" -Peter S. Beagle, The Last Unicorn. While I think many people will disagree with my view, the way Isaac handled everything was perfect for me (I do so value my independence). I would love to hear what others have to say, especially the ladies; how do you like to be treated? I love the topic of chivalry! When I was dating I took the more overt forms of chilvalry--door-opening, meal-paying--as indicators that the guy who asked me out cared enough to do those things. If I asked him out, then I took responsibility for those things. When it comes to long-term relationships, however, I like chivalry but not if it interferes with our status as equal partners. Josh and I have a joint bank account, which erases the who-pays issue. Even then, though, I try to treat him to things to show I love and appreciate him, and he does the same for me. I think that chivalry should always be based on mutual respect and that how you interpret that respect is really up to the individual. Respect is what I care about most in a relationship, rather than overt expressions of chivalry! That is a good policy: who ever asks pays (though I never have asked someone out, nor did I ever want to do so). I suppose it does, in a way, show that they are interested in you. And I agree: respect is very important!